Sea urchin is either passionately loved or fervently hated in the world of seafood consumers. Many of us seek out sea urchin roe in every restaurant, craving the sweet, creamy indulgence that bathes our senses in delight – others simply turn up a nose, refusing to allow the briny roe touch their tongue. Often the latter group hasn’t truly experienced the euphoria that comes with a buttery bite of sea urchin elegance. We invite you to treat your diners with our fresh sea urchin that will surely please their palate in any number of recipes. Sea urchin roe makes a divine adornment on simple crackers, as a rich filling in crepes, or in the form of uni atop sushi. With a buttery texture, urchin roe is a perfectly creamy delicacy that provides a rich and full experience with every savory bite. It must be consumed fresh for the best flavor and Pucci Foods is pleased to bring you the highest quality urchin roe found in the Bay Area. Your customers will leave satiated yet enticed to return time and again. 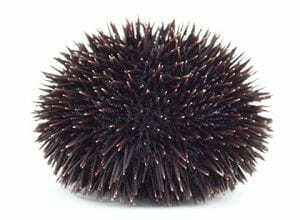 There are over 500 species of sea urchins in the world, many of which live to be 50-100 years old. Unlike other long-lived species, urchins reproduce at a young age and one female can produce millions of eggs. This high fecundity makes them resilient to fishing pressures. Wild fisheries collect them by hand with divers, ensuring very little impact on marine habitats. Some populations have been overfished in the past, but sea urchins from California and Canada have healthy and abundant populations. The Pucci Foods team believes in the duality of putting our clients first and respecting our oceans. We provide fresh, high quality seafood taken from sustainable fisheries. When you buy our products, your customers will enjoy delicious fish and shellfish while helping conserve our natural resources. Enjoy your wholesale sea urchin by filling out the form on this page and our team will be in touch soon.